Thread in 'Comparisons to Other Vehicles' started by Robin Cox, Jan 14, 2011. On Auto by tel today and Jeep is planning a truck of their new extended Jeep. Being the computer DA I am, I could not transfer the pictures. It is a Jeep Limited with a Truck bed. It looks like an extended cab Ranger size wise. I have always liked Jeeps, so somewhere down the road this may work. But for those of you that have to have a back seat, well I don't know, because again it looks like an extended cab Ranger. The ST was my compromise because there isn't a smaller, 4 door 4x4 that I like and suits my needs. I figured it was easier to put a solid axle on a ST than to add a bed to an Unlimited. The Gladiator has as much back seat space as a sports car, not gonna work for me. I'll just keep waiting...or get a solid axle in the mean time. Looks like the old Jeep Scrambler. Also, read the article. It looks like this was a concept back in 2005. Wheelbase is really long but ground clearance is good. Hello, Mr. Mullaly! Anybody listening at FoMoCo? All I hear is crickets when I ask that question! They should name it the Jeep Flop. It is not going to be worth a hoot, IMO. The coolest thing is probably the wheel/tire combo. Where the spare tire is mounted makes a huge blind spot when using the driver side mirror. And I hope that rear end is built up strong, because to where the gas tank is located, it would really be bad to get hit there. I also don't like the body line. In the front there sorta is a body line between the hood and fenders. There is a body line on and around the bed, but there isn't a body line to be found on the cab itself. It just doesn't connect. And one might think since this is an update to come, wouldn't you eventually make some better door hinges that are hidden. I think its total CRAP. Actually it doesn't look anything like the Jeep trucks that were made from the early 60's to 1983. They were the 'J' series trucks. 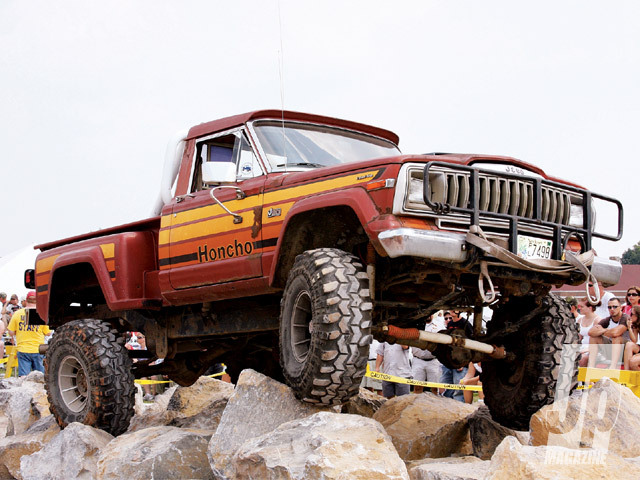 Honcho was one of the trim options for a few of the years. Here is a step side. They came in fleet side as well. Over on my full size jeep board they are loving the looks of the new truck pictured above. Farm truck IMO. Street service,,,,NAH! I loved those, I'd like to get one of those mexican ranger diesel engines and put it in one. on new truck side, those pictures are years old, I saw new ones and I thought the new jeep truck was a crew cab. Well, seven years after this thread originated, Jeep is finally releasing the Gladiator truck. I'm digging it so far.